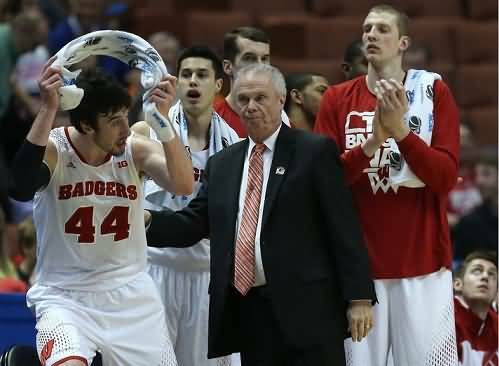 Former University of Wisconsin men's head basketball coach Bo Ryan is one of the elite college basketball coaches and is a member of the National Collegiate Basketball Hall of Fame (2017). Prior to coming to U of W, he was four-time Division III National Coach of the Year at UW-Platteville and won four Division III National Championships. At the University of Wisconsin, his teams have won five Big Ten titles and has made the NCAA tournament appearance every season. Coach Ryan was named Big Ten Coach of the Year in 2002. Coach Ryan developed his Swing Offense at UW-Platteville. The Swing offense is a 4-out patterned offense that has continuity. All five players are interchangeable, and spacing, screening, cutting and good passing are paramount. All five players learn to post up inside. The offense is deliberate, often with multiple passes and places value on each possession with high percentage inside shots, or free-throws. Unlike some of the recent, newer offenses that utilize the dribble-drive as it's main attack weapon, the Swing offense is truly a "team-offense" that places a premium on good passing, screening and cutting. The Swing offense is used against man-to-man defenses and combines elements of the UCLA offense, the flex offense, and the triangle offense. There can be a number of entries into the offense, and there are counters for every kind of pressure defense. Numerous variations can be used. Set plays can be called as well. Set Plays... seven set plays for the Swing offense. Diagram A below shows the basic set, which is 4-out, 1-in. O1 is the point guard, O3 is your best athlete and a good shooter, and O2 the off-guard is also a good shooter and ball-handler. O4 and O5 are your "bigs", but remember that all players will post-up inside and all players will play on the perimeter. O2 and O3 are at the free-throw line extended outside the arc, while O1 and O4 are balanced at the top. O5 (and all post-players) will locate just above (not below) the block. Notice that there is always a triangle (red lines) on the ball-side. Diagram B emphasizes that the first look every trip up the court is the initial pass inside to O5 posting up, as this can result in a quick, high-percentage basket (or free throws). Diagram C shows the initial movement with the pass to the wing O3. Rule: all pass receivers on the perimeter will catch the ball, get in triple-threat position, and look into the post. Here, O3 looks to O5 posting up inside. Rule: The pass from the wing is a bounce-pass or overhead-pass, but never a lob-pass. Rule: Whenever the ball is passed from the top to the wing, the weak-side players (here O4 and O2) will always exchange positions. This is not a "lazy" exchange, but a hard basket-cut for each player, as O3 might be able to pass to either cutter here for an easy basket. This also occupies the helpside defenders. But if the pass is not there, both cutters (O4 and O2) cut back outside, exchanging original positions. UCLA Cut. If O5 is not open, O5 cuts up to the elbow to back-screen for O1 (diagram D). O1 makes the UCLA basket-cut on either side of O5's back-screen... (Rule: cutters always take the path of least resistance... take what the defense gives you). O3 looks to pass to O1 on the cut. If the pass is not there, O1 posts-up on the low block and O5 pops out on top (diagram E). Next O3 passes back out to the top to O5 (diagram E). This triggers a weak-side flare-screen with O4 back-screening for O2 (Rule: whenever the ball is passed from the wing to the top, the weak-side wing flare-screens). On receiving the pass, O5 could be open for the outside jump-shot. Otherwise, O5 looks to feed O1 in the low post. Flex-cut. Next, the ball is reversed from O5 to O4 (diagram F). This pass triggers a flex-cut. O1 steps out and back-screens for O3. O3 makes the flex-cut to the ball-side low block. After screening for O3, O1 flashes to the middle. O4 could pass to either O3 or O1 for a shot. It's not unusual for O1 to get the pass and shot, as the defense oftentimes gets all caught up with the flex-cutter and forgets the screener. In real time, this wing back-screen does not always look like a true flex-cut, as sometimes the back-screen is high on the wing, and the cutter may cut high. Diagram G shows the pass from the top to the wing, and you can begin to see the continuity. Now we are running the offense just the same, but on the left side. Again, we have a triangle on the ball-side (O4, O2 and O3). Once again, the pass from the top to the wing (O4 to O2) triggers the weak-side basket-cuts and exchange. The wing O2 looks to pass to O3 posting up, or one of the weak-side cutters. If nothing develops, O3 moves up to the elbow and back-screens for O4 (diagram H). O4 makes the UCLA cut, looking for the pass from O2, and then posts-up on the ball-side block. Next, (diagram I) the pass from the wing to the top (O2 to O3) triggers the weak-side flare-screen (O5 screening for O1). On receiving the pass, O3 may have a jump-shot, or looks to O4 in the post. Here is one instance where you could use a lob-pass to the post... if O4's defender is full-fronting and O4 can move the defender up the lane-line, there may be spacing for O4 to make a quick cut to the hoop for the lob-pass. The guard-to-guard pass (diagram J) from O3 to O5 once again triggers the flex-cut. O4 steps out and back-screens for O2. O2 flex-cuts for a possible pass inside, and then posts-up on the low block. After screening, O4 flashes to the middle for a quick pass and shot inside. Diagram K shows the completed cycle, the continuity of the offense. We are now back in the original set as seen in diagram A, although the players have interchanged. The ball-side triangle is a key point. There a number of entries into the offense and numerous variations that can occur including elements of the dribble-drive and the Princeton offense (back-cuts). Skip-passes are effective against the packline defense and zones. And of course, set plays can be run as well. When a play breaks down, the offense re-establishes the ball-side triangle and runs the Swing. "The Swing Offense: Breakdown and Shooting Drills"
with Bo Ryan, former University of Wisconsin Head Coach.